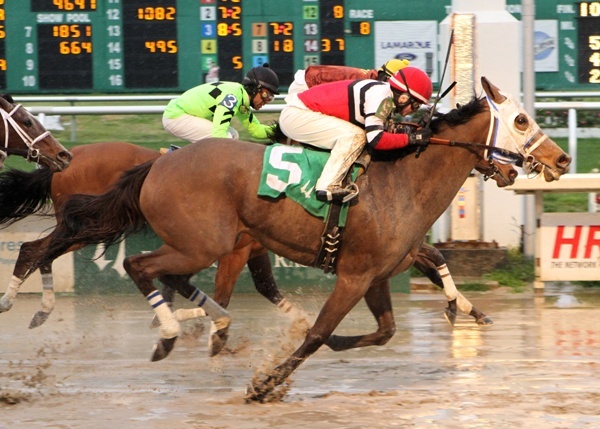 Although there is not a lot of gambling activity to be had in the state of Nebraska, horse race fans do have the opportunity to catch live thoroughbred racing at four seperate venues - Fonner Park, Horsemen's Park, Lincoln Race Course and Columbus Exhibition & Racing. The four tracks each host short racing meets and stagger their schedules so live racing doesn't overlap between them. All four also offer simulcast wagering. There is no OTB wagering in Nebraska. When the ponies aren't running in Nebraska, race fans can still be sure to get their bets down on all the top racing events in the US and at international tracks with an account in an online racebook. Online betting accounts are not only convenient, but offer promotions and bonuses that increase the odds of cashing out in your favor. In horse racing, there's no gaurantee that even an odds on favorite will hit the board when all the running is done, so it's nice to know that when you make your bet, most top racebooks offer a percentage of your wager as a cash back bonus whether your horse wins or loses. Not all cash back offers are the same, and most offer one percentage amount back on exotic bets, and a lower amount on Win, Place or Show bets. At BetOnline.ag, they offer 7% on all bets made online, giving you more options for the same rate of return. Although Ak-Sar-Ben (Nebraska spelled backwards) was considered one of the top race tracks in the US in terms of attendance and handle during its 70 years of existance, events conspired that saw the track that opened in 1919 closed for good in 1995. Since then, there has been no major track operating in the state, although limited live racing goes on at four different small tracks. In operation since 1954, and located in Grand Island, Fonner Park hosts a live thoroughbred racing meet from late February through to early May. Racing takes place on Friday, Saturday and Sunday afternoons. They offer year-round simulcasting from more than a dozen tracks throughout the US, strarting at 11:00 AM daily. In addition to live racing the facility at Fonner Park is home to many agricultural-based activities such as the Nebraska State Fair. As such, they provide RV parking for tourists. The casino room features Keno, and there is full-service dining and a bar onsite. Primarily a simulcast facility, Horsemen's Park in Omaha does offer limited live racing on three weekends in July. For 2017, there is racing July 7-9, 21-22, and 28-29. With the focus on simulcasting, the facility provides seating for 3000 and includes more than 700 TV screens, offering simulcast wagering seven days-per-week from both thoroughbred and harness racing tracks throughout North America. They also offer advance wagering on races that are being held after closing hours. There's a full-service restaurant on site. A sister track to Horsemen's Park, Lincoln Race Course is also primarily a simulcast facility, although they do have one weekend of live racing in mid-September. Like Horsemen's Park, they offer seven-days-per-week simulcasting, with doors opening at 10:30 AM. There is full-service dining on site. Located at the Columbus agricutltural grounds, Columbus holds live racing from the first week of August through the first week of September, with evening racing on Friday and Saturday, and afternoon racing on Sunday. They have a year-round simulcast shcedule as well, although the facility is only open for simulcast wagering on Thursday through to Sunday, opening at 11:00 AM. There is a restaurant on the grounds that is open every day of the week.